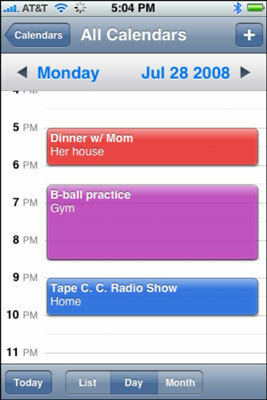 You have several choices as to how you view your iPhone’s calendar. 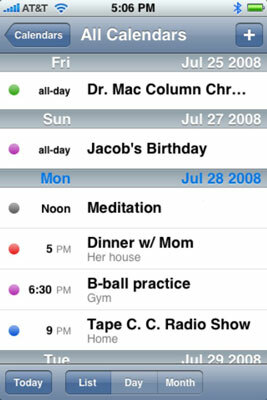 Your calendar has a List view, a Day view, and a Month view. Check out the List view. As the name indicates, the List view presents current and future appointments in a list format. You can drag the list up or down with your finger. Or flick to rapidly scroll through the list. The List view pretty much compensates for the lack of a week-at-a-glance view, though Apple could certainly add such a feature. The Day view reveals the appointments of a given 24-hour period (though you’ll have to scroll up or down to see an entire day’s worth of entries). In Month view, you can see appointments from January to December. 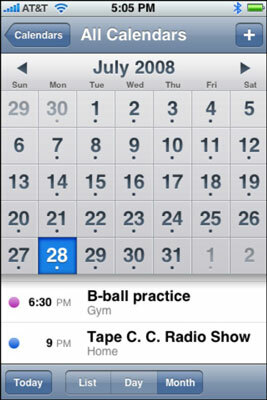 In this monthly calendar view, you’ll see a dot on any day that has appointments or events. Tap that day to see the list of activities that the dot represents. It’s just below the month in view.